...the work could never have been completed without the encouragement and assistance of many people... especially J.R.R.Tolkien, who wrote not only enthralling books, but also meticulous ones. Only such breadth of knowledge and attention to detail could provide the data for an entire atlas. If there is an indispensable reference guide in reading the books of J.R.R.Tolkien it is The Atlas of Middle-earth. When one envisions an atlas, one thinks primarily of maps, and there are wonderfully detailed, intricate, and informative maps in Fonstad's book. But there is so much more! Besides the maps, there are charts, sketches, battle plans and timelines, just to name a few noteworthy and critical items. Most importantly, however, are the explanations and analyses of every chart, map and graph. Don't leave the bookstore without this book. The book spans the First, Second and Third Ages of Middle-earth and it is fascinating to see Tolkien's landscapes change with time. Army movements, journeys and travels, as well as event timelines, are chronicled throughout the book. Visit all of your favorite places in Middle-earth. Take part in all of the key events that shape Tolkien's stories. Your understanding will be enhanced immeasurably by Fonstad's book. ♦ Want to really understand the detail and ramifications of the Battles of Helm's Deep and the Pelennor Fields? You will be amazed at all the data and logistics that are brought together from the far flung chapters of Tolkien's books when his characters go to war in Middle-earth. 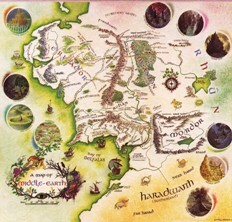 ♦ It is history and geography all rolled together in one place when you read of Númenor, The Shire, the migration of the Hobbits, and the Kingdoms of the Dunédain. ♦ The individual journeys of all the members of the Fellowship are chronicled in great detail as they play out their own important parts in the quest to destroy the One Ring. For the first time, you will know exactly what Sam and Frodo are doing on the same exact day that Aragorn used the palantir to reveal himself to Sauron. Revelations abound.